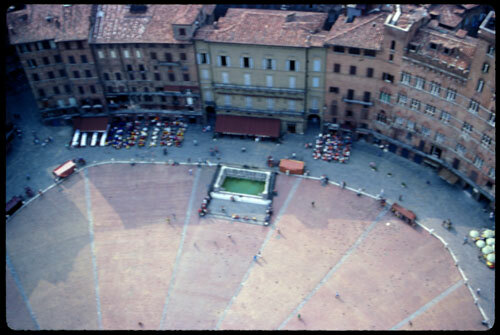 Siena, a horse race; in Florence, a medieval soccer game. Perhaps the equally important functions of squares are not so much as places for history making, but in between times, when they function as the “public living rooms” of cities: places for lovers to meet, pensioners to play chess, individuals to read or just people-watch, and the myriad of other commonplace activities that comprise the circadian rhythms of the city. They are part of the furniture of the city that invite contact and conversation, but also solitariness and anonymity. Often combing aspects of the city’s collective history as well as playing a role in the biographies of its individuals they are much missed when circumstances destroy them. The main square in Warsaw was totally destroyed in World War II, but reconstructed as it was in the 18th century from the vedute paintings of Bernardo Bellotto. The following is a score of famous city squares (or piazzas, platzs, places, namestis as the linguistic case may be). Match them with their cities.